will not have, nor do they deserve, either one." 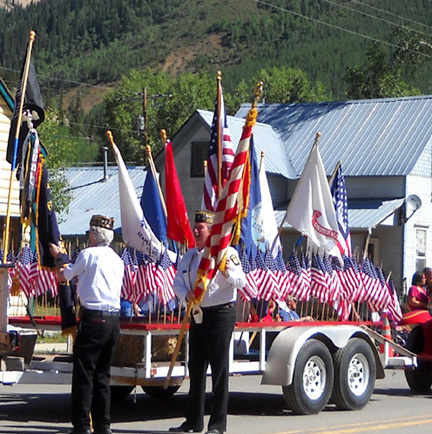 What's more patriotic in America on Independence Day than attending a small-town parade? 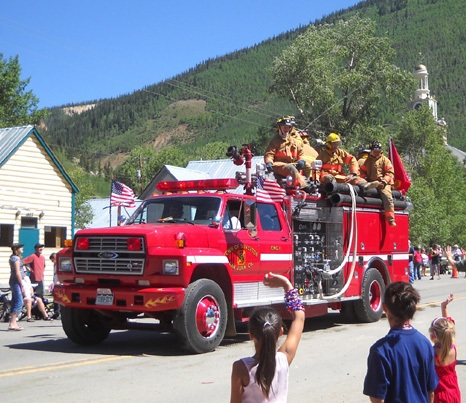 Little kids waving flags, war veterans in uniform, fire and rescue personnel driving new and/or antique fire trucks, Shriners driving their little cars in loops and swirls . . . 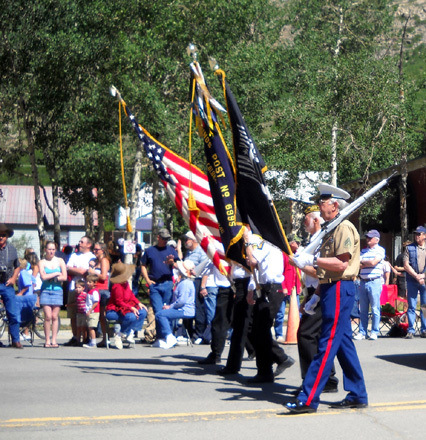 Seriously, what small-town parade does not have local Shrine participation?? I always have to laugh at those (usually older) guys stuffed in their tiny cars. Although they look a bit ludicrous I love their childlike spirit and would wonder where they were if they didn't appear. It's a touch of Americana. 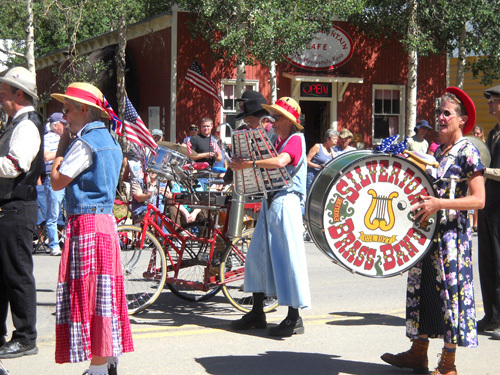 The town of Silverton, Colorado, with a year-round population of only about 500 people, draws at least ten times that number of visitors for its annual July 4th celebration. 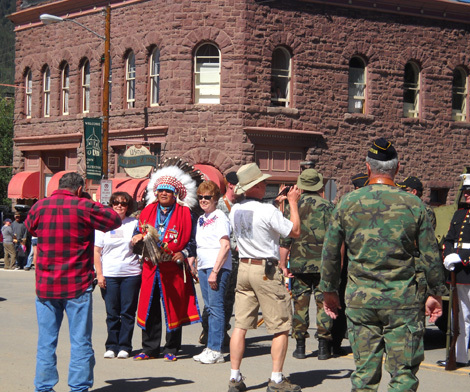 Many of them come up for the day from the much larger metropolis of Durango sixty miles to the south. 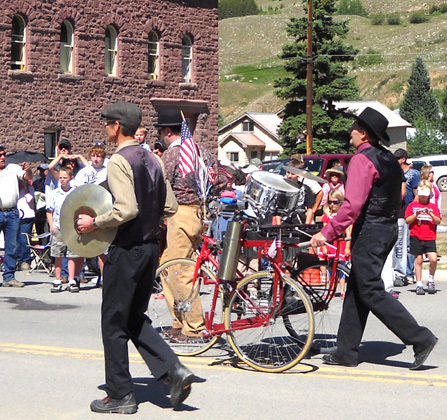 Silverton must be doing something right to attract that many people. Right? Well, that and the lure of all these gorgeous mountains with dirt roads that attract everyone within two states who owns a Jeep, ATV, or dirt bike. 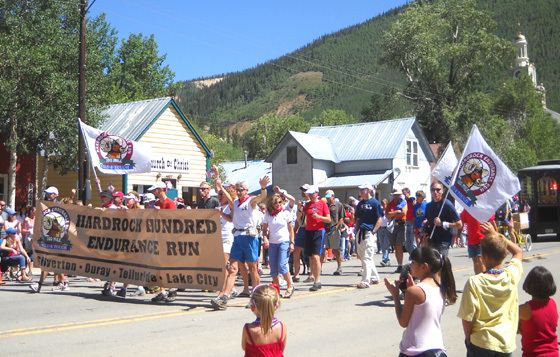 And folks involved with the Hardrock race, of course. 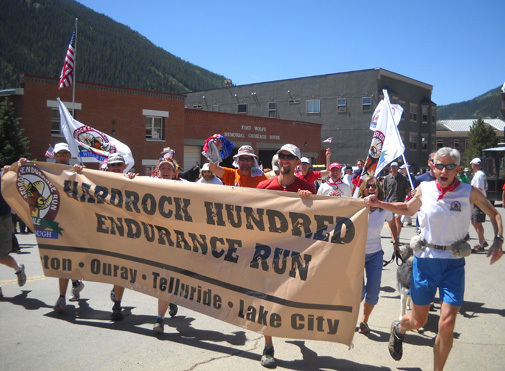 That would be us, although we just spectated and didn't march with the Hardrock group as we've sometimes done in Leadville with the LT100 gang during Boom Days. 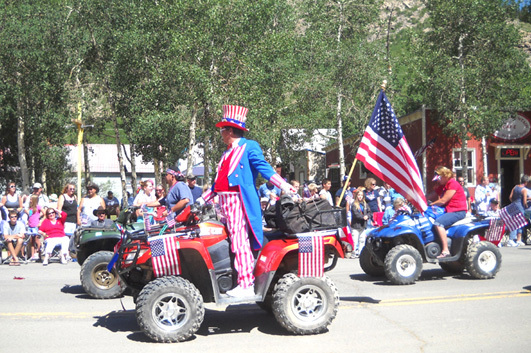 If we're walking in the parade, we can't see the other participants. 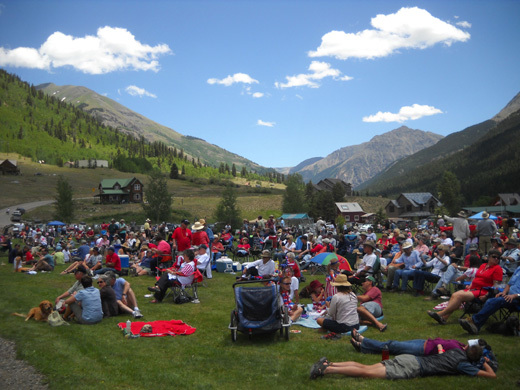 The holiday is more than just the 4th for most people, often stretching into several days or a couple of weeks of vacation time. 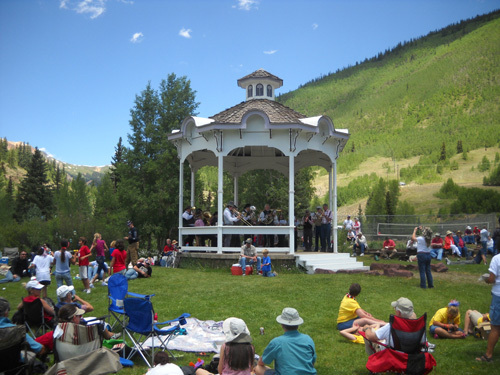 There is plenty to do in the Silverton area to keep them occupied as long as they're here. 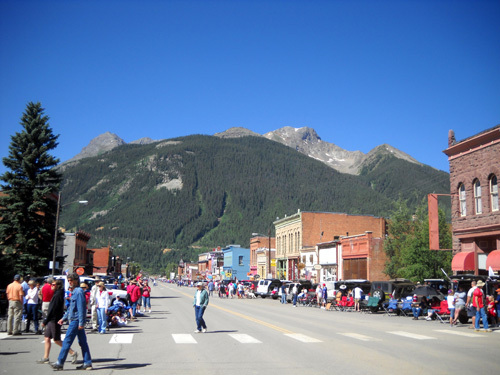 This is the fourth time since 2006 that Jim and I have been in Silverton during this holiday, except we aren't here for that reason. 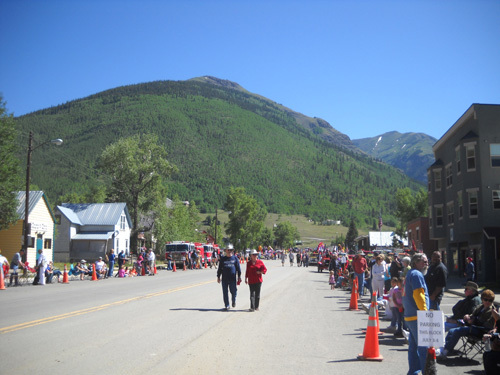 We're here to enjoy the mountain trails, see running friends, and volunteer for the race, which always occurs a few days after the July 4th holiday. 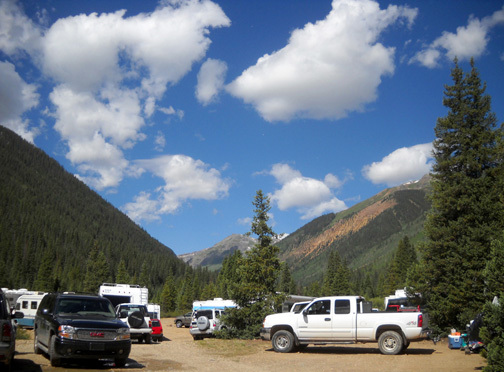 We have to get here well before the holiday, though, in order to secure a decent dispersed (i.e., free) national forest camping spot -- because everyone and his cousin seem to want to be in Silverton for the festivities. Hotels, motels, B&Bs, and rental housing are booked up months in advance, too. 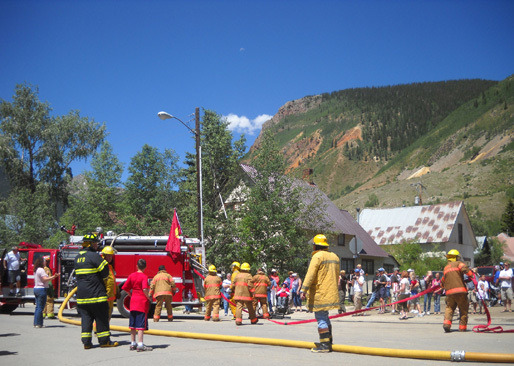 Every year the town has appeared to us to draw an increasing number of visitors to the various activities that are offered on the 4th of July -- the fun run/walk early in the morning, the mid-morning parade down the main street, the water fight between the Silverton and Durango fire departments, the Silverton fire/rescue BBQ, the rhubarb festival and brass band concert, the rubber duck derby in the afternoon, and the evening fireworks display. It's a full day and evening of activities to celebrate our nation's heritage -- and the freedom to celebrate it however we want. Lots of folks enjoy the popular Rhubarb Festival in the city park. One year Jim attended the parade but today was my first time watching it. 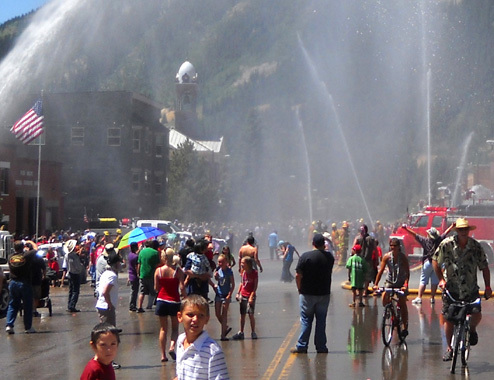 It's the first time for either of us to watch the water fight or enjoy the rhubarb festival . We have yet to participate in the other activities or fight the crowds to see the fireworks display. We figure the fireworks can't be any more spectacular than the ones we've seen in major metropolitan areas and the Olympics in previous years. Can they? Maybe we're missing something really special. We woke up to a perfectly beautiful sunny morning, refreshing after two overcast days with intermittent rain. We determined where the parade would be going and chose to stand catty-cornered from the Wyman Hotel, owned by our friends the Wrubliks. 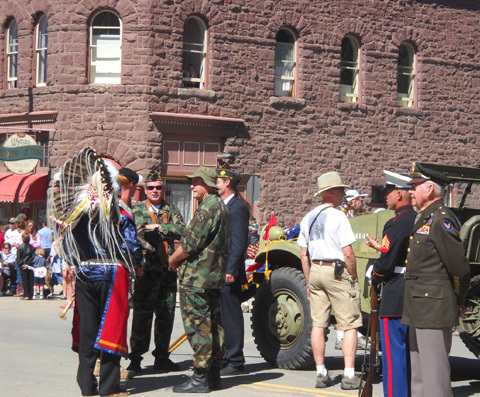 That corner was a good spot, near the beginning of the parade. 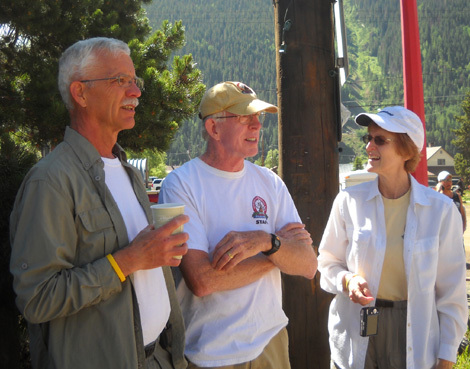 On the way to that location we serendipitously ran into Paul and Jigger, the couple with whom we'll be sharing ham radio communications duties during the Hardrock race at Grouse Gulch this coming weekend. We've never met them before, had no idea what they look like, and there were no name tags involved. Somehow we just found each other. 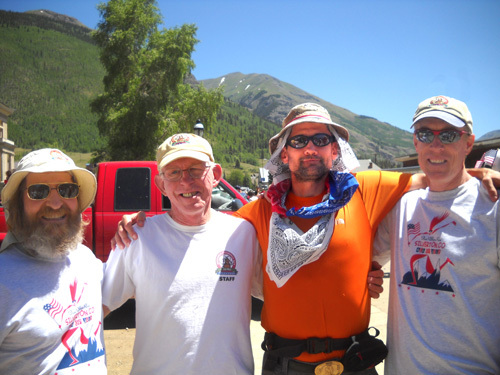 Guess it was the Hardrock volunteer shirts we all had on! 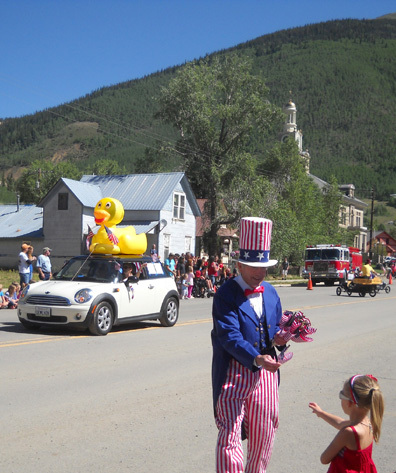 Visitors were encouraged to purchase a little toy duck that would be floated down Cement Creek (which runs by Memorial Park) later that afternoon. 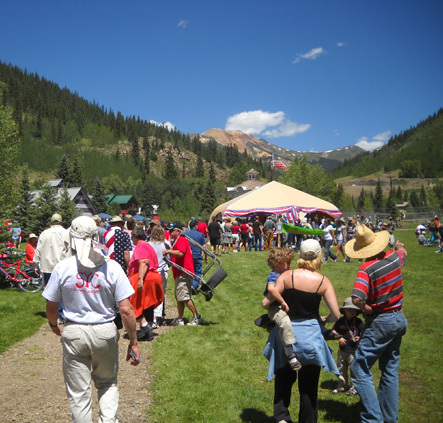 Prizes were awarded to the winners and proceeds will benefit the city. Since the parade also ended at our intersection, we only had to cross the street to greet our running friends when they stopped and folded up their banner. 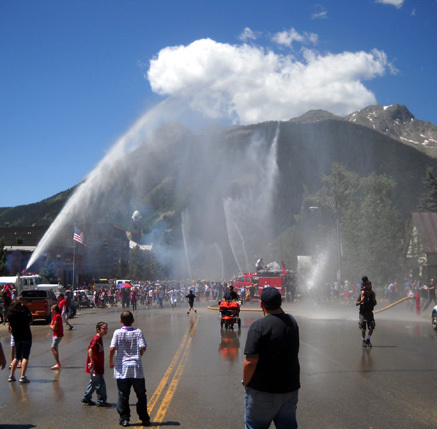 After all the groups in the parade came back to our intersection and dispersed, the Silverton/San Juan and Durango/Animas fire departments moved their water trucks into position farther down the main street for the popular water fight. I don't remember ever seeing one of these but it was pretty much what I envisioned. That yellow line is 5" hose. How can anyone hang on to that when it's at full pressure?? They can't. It's too powerful. 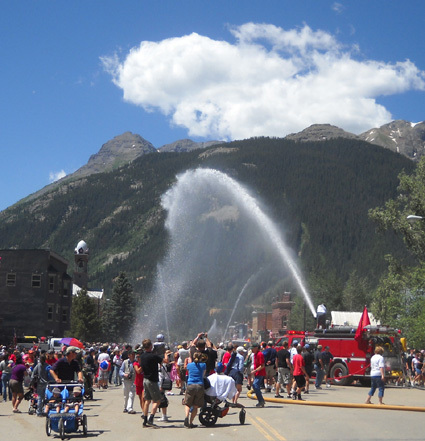 That line feeds water into the pumper truck for the deck gun, which can direct a long and powerful stream of water onto a fire, Jim explained. There's a picture of the spray from a deck gun farther below. 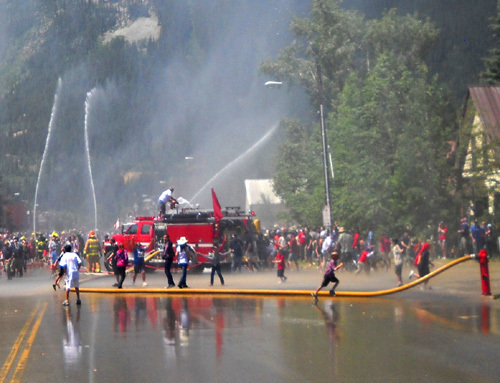 The firemen handheld the smaller red hose when they doused the other guys (and the crowd). 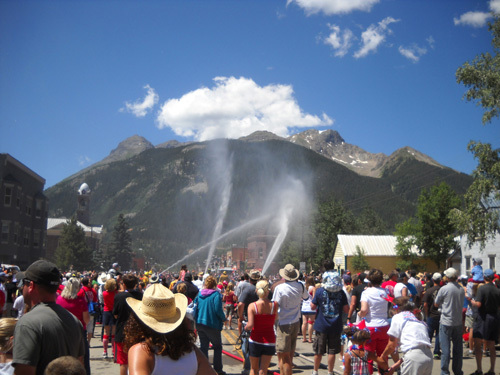 Both lines were connected to a fire hydrant for a constant supply of water during the duel. We weren't sure exactly where the water was going to be sprayed so we initially kept our distance. We weren't too concerned about getting wet -- that sun was getting hot -- but we didn't want the camera destroyed. Once we determined where it was safe to watch, we moved closer. I had as much fun watching the spectators as the water! The person with the big umbrella had the right idea -- (s)he's been to one of these events before! So . . . was that just a colossal waste of perfectly good water, or did it have some benefit to the community? Maybe both, but it sure was fun to watch the first time. If I was still a little kid, I would have definitely said it was worth it. Big "kids" (including the firemen) sure looked like they enjoyed it, too. My mom used to grow rhubarb plants on our farm when I was a little girl and she'd make yummy rhubarb pies from the reddish pink stalks. I've never made a dessert from rhubarb and it's probably been forty years since I've had one at a family reunion or county fair . 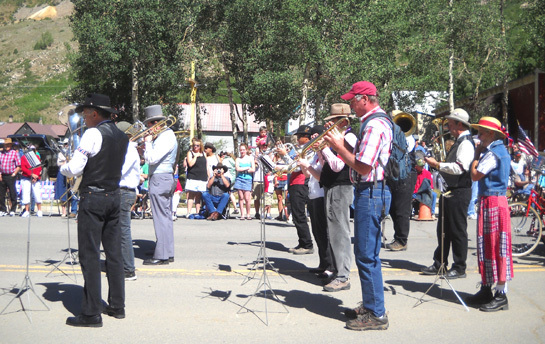 . . so when we discovered that a rhubarb festival was part of the holiday tradition in Silverton, we had to go. Too bad we didn't do that back in 2006 when we first started coming here during July. We've been missing a delicious tradition. 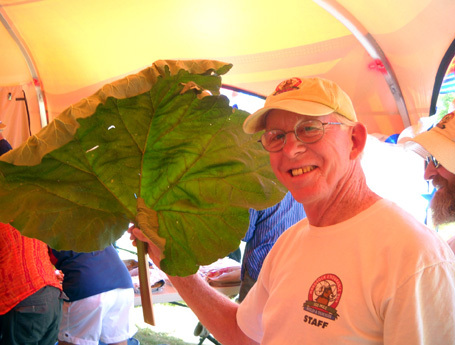 Jim holds up a large rhubarb leaf by the stalk; Alan Holtz is on the right. Paul and Jigger, our ham radio friends who come up to Silverton from Durango most years for the festivities on the 4th of July, advised us that the rhubarb festival is very popular and to make our way to the city park as soon as the water "fight" ended or we'd have to wait in a very long line of people. 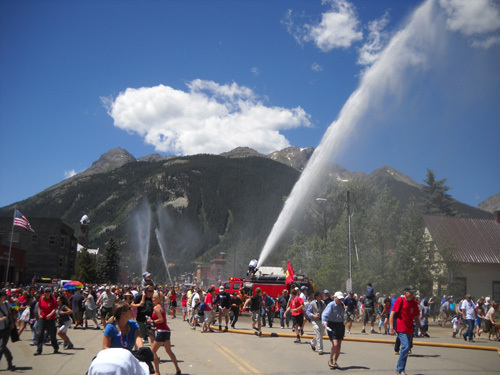 That was the second major reason we watched the parade and water fight from where we did -- we were between the water fight and the park. All we had to do was walk a couple blocks to the park. There were still plenty of goodies to buy and we beat the biggest part of the crowd. 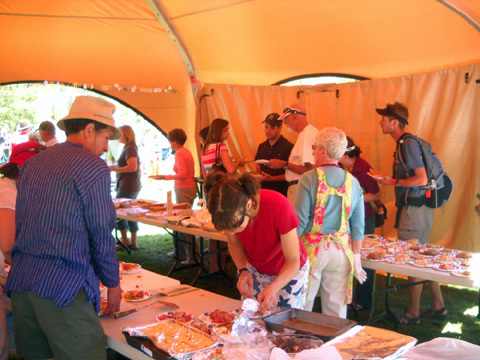 Andrea, in red shirt, cuts a piece of rhubarb pie for a customer. Jim chose a piece of rhubarb pie and I selected rhubarb crisp. We both opted for a scoop of vanilla ice cream on top. Yum!! Lots of calories and more pricey than we usually pay for a treat ($4 each), but the cause is good -- the Silverton Public Library is the beneficiary of the proceeds from the rhubarb festival. Whole pies were also offered for sale. After we finished our desserts we wandered around the park to hunt for other friends. 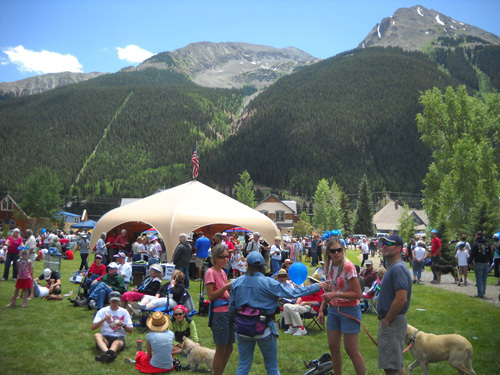 As you can see from one of the pictures near the top of this entry, there were a lot of folks enjoying the delicious desserts, mellow band, cool grass, warm sunshine, and camaraderie. Some took chairs, tables, even canopies to spend the afternoon at the park. What a fun, relaxed atmosphere! 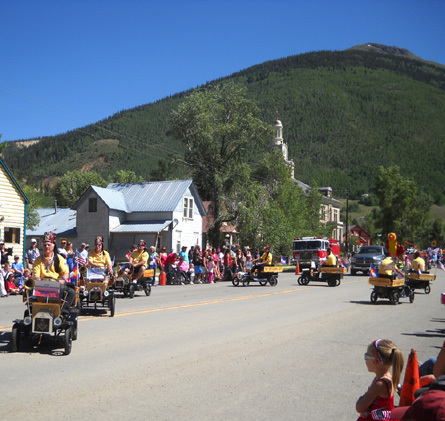 Although we saw plenty of dogs at the parade and rhubarb festival we opted not to take Cody with us into town for several reasons. He's well-behaved but would have been overwhelmed with all the people, smells, and sounds (including sirens and gunfire). We opted out of the fireworks display again. Friends who attend say it's very good, although not as elaborate or extensive as big-city events. There are a lot of places around town to watch the display. 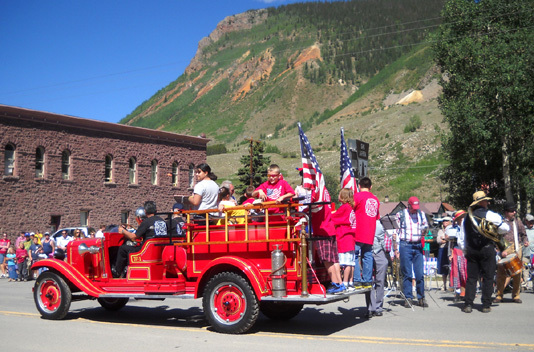 There is no fee, although contributions to the fire department to help pay for the fireworks are encouraged during the earlier events in the day.